Employing Nikon's VR (Vibration Reduction) system, vibrations of the image in the viewfinder caused by hand movement are reduced*, and the irradiated laser is also aligned at the same time. 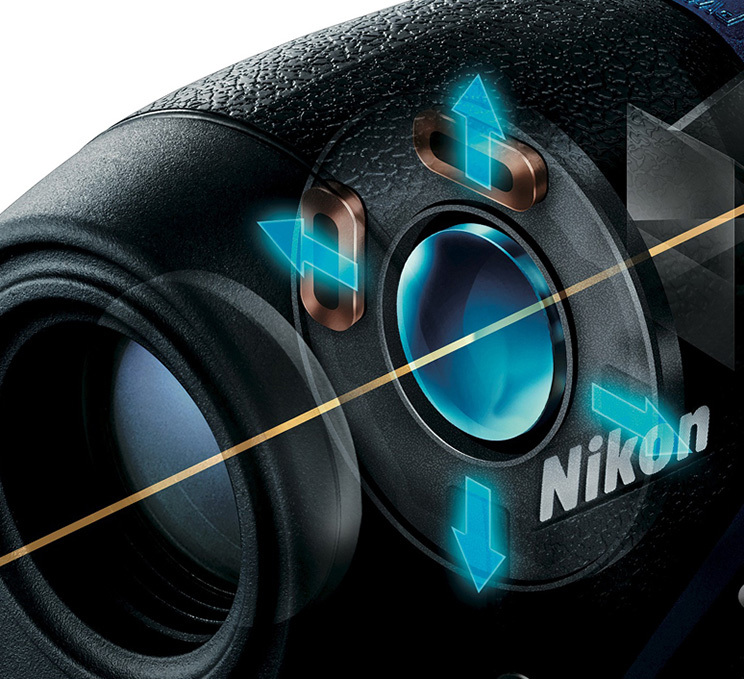 Because you can direct the laser onto the target faster and more easily, the ease of measurement to a small subject is greatly improved; all achieved by Nikon's original technologies that are a fusion of VR Technology and high-performance measurement function. *The effect of Vibration Reduction: Vibrations of the image in the viewfinder caused by hand movement (sinusoidal waves) are reduced to approx. 1/5 or less (Based on Nikon's measurement standards). VR (Vibration Reduction) function is employed for reducing the vibration caused by hand movement. *Based on Nikon's measurement standards. Distance measurement display step: 0.1m/yd.